Italy vs Germany is a not bad game so far. I really want the Germans to win, mainly because I love seeing the Italians lose because they take it so badly (cf England 1966, Korea and Japan 2002) but also because I didn't meet a single unfriendly German in the twice I was over there recently. The whole place is World Cup mad and they put on a bloody awesome tournament from what I could tell. I didn't answer it first time; nor second time; but conscience got the better of me and I logged into messenger to see what the fuss was about. Cue a 3 hour IM conference, the first 2 hours or so of which are hazy to say the least. Then IM went down and I was chatting to Welsh Mark on IRC for a while, having decided myself that I was beyond the point of no return and staying up all night was the only choice available to me. Come 4am and I was a proper wreck. Struggling to stay awake and all alone online I had an apple, cleaned me teeth, drank some sugary drinks, just generally trying to stay awake and deal with the agony that is a creeping, waking hangover. Eventually I had a shower, packed a bunch of stuff for the trip and headed to the cab office. The local cab office is not open 24hrs. Got a bus to Hounslow. I didn't mean to get it there, but fell asleep for the minutes surrounding each intermediate area I promised myself I'd stay awake for (Kingston, Teddington, Twickenham). Made the dreadful decision of getting the 111 from Hounslow to Heathrow rather than the tube, although it's conceivable that had I gone underground I might not have resurfaced until Cockfosters. Was getting mighty panicky about missing the flight having failed to remember just how far off the beaten track the 111 goes, but in the end managed to get through security before the gate had been announced. The flight was, I assume, uneventful; I was asleep before the safety demonstration and only just managed to keep my eyes open long enough to eat the breakfast mid-trip. Stumbled off, through passport control and into the terminal where I managed to successfully withdraw some euros, buy a ticket into the centre, and arrange a rendezvous with me bro' and his missus. Got the S-Bahn and emerged confused by the myriad exits from Stuttgart Hbf, arriving on ground level outside a boozer and finding myself unable to get hold of Kevin. Called Sal who said he wasn't with her, he was on his way to meet me. Would have helped if he was answering his phone... but then he called and found me. Walked for 10-15 minutes in the opposite direction to the city centre to my hotel, the somewhat misleadingly named "Mercure Stuttgart City Center" and checked in, dropped me stuff off, and wandered back to meet Sal. A brief excursion through several wonderfully air-conditioned shops was brought to a halt when my thirst and hunger overrode any desire to buy goods not fit for consumption. Accordingly we sat outside a bar and had some shandies (nb: not slang; we drank Radler), which weren't very nice so Kev and I graduated onto some local weissbier -- which also wasn't very nice. What was nice however were the Diavolo pizzas. Huge and mightily spicy, covered in 5-second chillis, mmm. Thursday was something else. 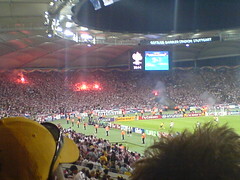 SO MANY CROATS in town, almost all fully merchandised up in the red and white checkerboards, and by 'eck can't them lads sing. Not only that but the entire nation is populated by people who are 6 foot 5 or taller. Very enjoyable seeing Aussie sport fans intimidated too, heh. Went to the ground with quite a lot of time to spare and followed the signs to our zone, but I reckon we made a wrong turn somewhere 'cos we ended up wandering along a long road with an industrial estate on one side and not much on the other, only a distant view of the stadium. After a while we stumbled across a decidedly temporary looking beer stall which actually marked the entrance into a far more permanent fixture, but whose atmosphere was really quite spooky and whose corridors were filled with smoke. Nonetheless we had a couple of drinks in there before heading back round the road until finally coming across a stadium entrance. I won't bother doing a match report 'cos there's doubtless a thousand and one places where you can read a better one than I could write, especially considering the distance by which we were separated from the pitch. We didn't even know Poll had shown a yellow to Simunic twice, much less three times, nor could we tell in the ground that there were penalties that should have been given. But it was bloody entertaining, both on and off the pitch (how do Eastern European supporters manage to smuggle flares into football matches?) and the journey back into the centre was more comfortable than a Monday night trawl back from Charlton to KT6. Had a drink while lounging on deck chairs before getting a cab back to me hotel. Bro and sis-in-law buggered off before I got up on Friday so I was free, to do what I want(ed), any old time. So I wandered the by now well-beaten track into the centre. Bought an official FIFA World Cup shirt (we'd wandered through quite a lot of merchandising in various places the day before but I hadn't been able to decide; this time I forced meself as if being hassled by an irate waiter in a curry house), discovered yet more nice bits of town including a huge park with a bunch of fountains and other stuff. Spotted a bridge which looked like it went over a river, crossed it to discover it was going over a main road outside the train station but was pleasantly surprised to discover that on the other side was yet another huge park. But it was baking hot and I didn't want to burn up so I went to a pub and sat inside with a pint and me book. A couple of chapters later some English lads arrived, a couple of Burnley fans and one Leeds. Joined them for a drink and some banter and towards the end was joined by another Leeds guy who had been following the team around Germany and not even camping, just sleeping in his car. Can't remember -- in fact I don't think I caught it properly at the time -- what he said, but I got the distinct impression it was an expression of his distaste at having to share a drink with a Cockney. Like any good reporter I made my excuses and left, for another wander. But I was bored and after a short while walking in the heat just went back to the hotel and watched whatever game was on, Switzerland -vs- Korea IIRC. The journey ended much as it had started; a 111 followed by a 281; and I was home in time for Argentina -vs- Mexico's second half and extra time.